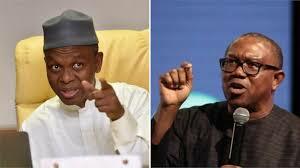 The Vice Presidential candidate of the Peoples Democratic Party, Mr. Peter Obi, on Saturday asked governor Nasir El Rufai of Kaduna State to stop making inflammatory statements that could incite hate amongst Nigerians. El Rufai had tweeted that Obi stopped him from moving around Anambra State during the governorship election in the State in 2010. But Obi while answering questions from journalists on the matter at a youth programme in Nnewi, Anambra State, said he was shocked to read such an outburst of hate from El Rufai, especially when “the statement came unprovoked. The former governor of Anambra State advised Nigerians, especially those in positions of authority, to avoid what he called “the dominance of the vice of hate” over the virtues of love in whatever they do.